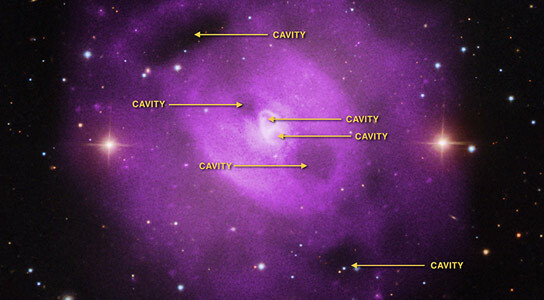 This composite image shows the X-rays from Chandra and visible light data from SDSS. NASA’s Chandra X-ray Observatory reveals that a supermassive black hole at the center of a group of galaxies has erupted multiple times over a period lasting about 50 million years. Evidence for the eruptions can be found in the cavities, or bubbles, carved out of the hot gas that envelops the galaxies and glows in X-rays. Scientists discovered this history of black hole eruptions by studying NGC 5813, a group of galaxies about 105 million light years from Earth. These Chandra observations are the longest ever obtained of a galaxy group, lasting for just over a week. 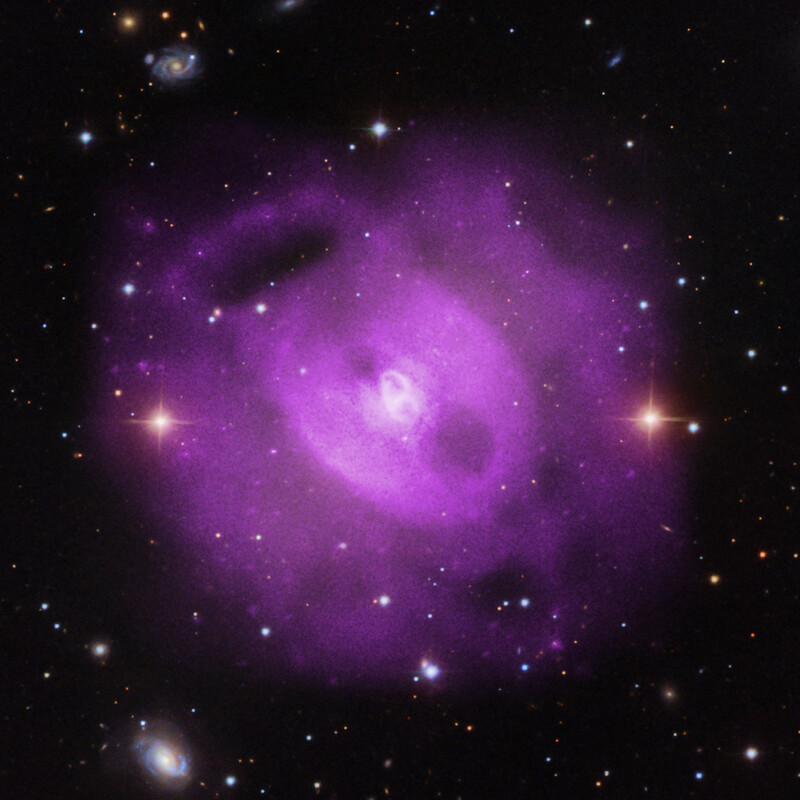 The Chandra data are shown in this new composite image where the X-rays from Chandra (purple) have been combined with visible light data (red, green and blue). Close study of the shock fronts reveals that they are actually slightly broadened, or blurred, rather than being very sharp. This may be caused by turbulence in the hot gas. Assuming this is the case, the authors found a turbulent velocity – that is, the average speed of random motions of the gas – of about 160,000 miles per hour (258,000 kilometers per hour). This is consistent with the predictions of theoretical models and estimates based on X-ray observations of the hot gas in other groups and clusters. A paper describing these results was published in the June 1st, 2015 issue of The Astrophysical Journal and is available online. The first author is Scott Randall from the Harvard-Smithsonian Center for Astrophysics (CfA) in Cambridge, MA and the co-authors are Paul Nulsen, Christine Jones, William Forman and Esra Bulbul from CfA; Tracey Clarke from the Naval Research Laboratory in Washington DC; Ralph Kraft from CfA; Elizabeth Blanton from Boston University in Boston, MA; Lawrence David from CfA; Norbert Werner from Stanford University in Stanford, CA; Ming Sun from University of Alabama in Huntsville, AL; Megan Donahue from Michigan State University in East Lansing, MI; Simona Giacintucci from University of Maryland in College Park, MD and Aurora Simionescu from the Japan Aerospace Exploration Agency in Kanagawa, Japan. NASA’s Marshall Space Flight Center in Huntsville, Alabama, manages the Chandra program for the agency’s Science Mission Directorate in Washington. The Smithsonian Astrophysical Observatory in Cambridge, Massachusetts, controls Chandra’s science and flight operations. 1 Comment on "Chandra Reveals Evidence of Multiple Eruptions from a Black Hole"
Almost looks like the whole black hole is spinning erratically or maybe on more than one axis. like having it’s normal latitude spin while the whole thing also rotates like a gyroscope. Perhaps it came into close contact with something even more massive like a larger black hole. If so wouldn’t the direction of the massive bursts be spread out instead of being concentrated at the poles?